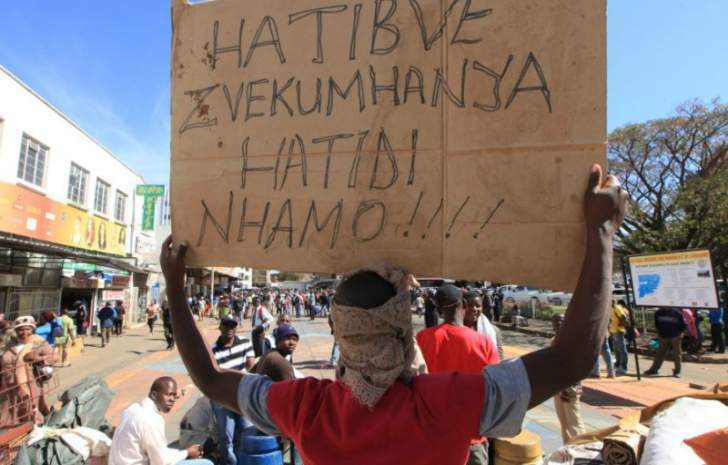 STREET vendors and market stall holders in Harare's CBD have vowed to return to their vending spots even after the state unleashed regular and municipal police Saturday to drive them off the streets for allegedly fuelling the current cholera scourge that has killed 27. Speaking to NewZimbabwe.com during skirmishes which saw police pull down stalls and also seize some wares weekend, the vendors accused politicians, who have now secured their jobs after elections, of ill-treating them. "We are not going anywhere. The streets are our livelihood. Where do they want us to go? They must give us jobs because vending is our only way to survive now," shouted one vegetable vendor during Saturday's chaotic scenes. "We voted for them but now they are taking us for granted and forgetting that we also want a decent life. We have our (educational) certificates too. "We will remain on the streets and fight back if police and soldiers repeat what they did on 1 August. We will fight back using stones." August 1 saw opposition demonstrations against alleged poll fraud being met with army gun fire leading to the killing of six. Last week, Harare city authorities appealed to informal traders to voluntarily move off the streets of the CBD beginning Saturday for designated trading sites. The appeal came in the wake of a cholera outbreak in Harare which is now spreading to other places in the country. "We have taken this action in the interest of public health. We are in constant engagement with the leadership of the informal sector to map sustainable solutions," the council information department said. On Saturday, police water cannons and anti-riot police were all over the CBD to enforce the ban. But there was a visible decrease in volumes of vendors who throng town everyday as many chose to stay away while observing the reaction by the authorities.